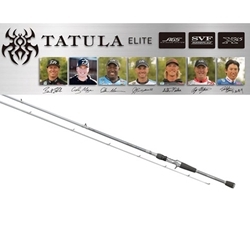 Daiwa’s added Tatula Elite Series Bass Rods to its stellar line up. What makes these rods so special? These are true signature series rods that were developed by Daiwa’s Pros such as Randy Howell, Brent Ehrler, Ish Monroe, Takahiro Omori, Andy Montgomery, Seth Feider and Cody Meyers. Each pro was asked to pick their favorite techniques and design specific rods to be the ultimate action to accomplish that technique. Our Pros were given absolutely free reign to pick rod blank, guides and reel seat, so this series is the perfect personalized series line of rods. Now anglers do not have to guess what the right rod action would be for a specific technique. Daiwa pros have taken all of the guess work out of it so you don’t have to hunt for the right rod and can concentrate on catching more fish.